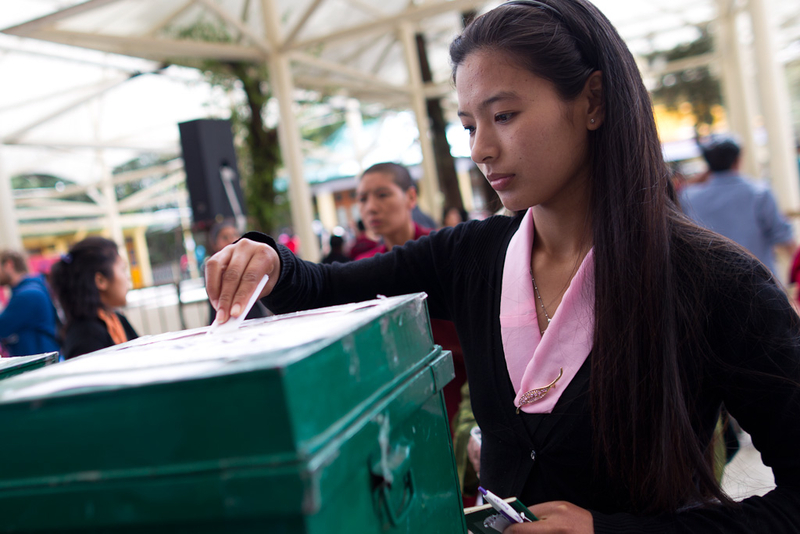 With just over a month left until Tibetans queue at voting booths around the world to elect the Sikyong and Members of Parliament, I think it is important to reflect on our electoral process and explore opportunities to further strengthen democratic practices in exile. The Tibetan Election Commission (EC), the unit charged with overseeing and implementing elections in exile, remains challenged with limited human and financial resources. Armed only with a small staff and insufficient resources, the EC oversees 87,000 plus voter registrations and conducts primary and final elections in over 30 countries. These are major accomplishments, especially considering all the challenges that the EC faces. I recognize the monumental tasks that lay in front of the EC team and the dedication with which the EC staff perform their duties. However, I sincerely believe that there are changes we can introduce in the electoral process that will significantly improve it. 1. Prepone the Chief Election Commissioner’s Appointment: The current Chief Election Commissioner (CEC), Sonam Choephel Shosur, was appointed on September 15, 2014, which afforded him a little over a year to prepare for both the primary election on October 18, 2015 and the final election on March 20, 2016. Two additional Election Commissioners were appointed in mid-2015 to assist the CEC. Timing of the appointments allows only a short period to prepare for the general elections, and it presents exceptional challenges if the newly appointed Election Commissioners are not well versed in election-related rules and procedures. It is critical to provide the new team more time to educate themselves on election-related literature, study previous exile elections, and plan ahead for anticipated challenges. The way it stands right now, each Chief Commissioner has a year and a half to prepare for the general elections and three and a half years in office after the election. It may be beneficial to flip the duration so that each CEC has three and a half years in the lead up to the general elections, and a year and a half after the election. The exile government can accomplish that by either appointing the new CEC towards the end of 2017 while the current one is still in office, or by changing the duration of current CEC’s term. 2. Establish an Advisory Board with Electoral Experience: Due to the limited pool of individuals in the Tibetan community with extensive backgrounds in democracy studies, it would be incredibly helpful if the EC has access to a team of advisors who can provide guidance and assistance if and when needed. Essentially, a team of experts on democracy and elections, who can serve as consultants to the EC, would be immensely beneficial. The advisory board should be comprised of individuals who can bring both theoretical knowledge and practical election-related experiences to the table. For example, individuals who have served in election commissions, studied democratic principles and procedures, worked with election monitoring agencies, or have other relevant experience would make good candidates to serve on the advisory board. To keep the EC free of any influence from the Kashag and the Parliament in its endeavor to promote a free and fair election, the advisory board should not consist of any officials actively serving in the exile government. 3. Revise Necessary Electoral Rules and Regulations: It took the EC almost four months to announce the final Sikyong and parliamentary candidates after the preliminary election was held on October 18, 2015. Of course the EC is short-staffed, and that may be one reason for the delay, but antiquated rules and regulations contribute to such delays as well. For example, the rules stipulate that candidates with the most number of votes should be given 20 days to withdraw their candidature for the Sikyong’s post and 45 days for parliamentary post after the results are announced. This rule used to make sense in the past when candidates were less likely to self-nominate and had to be courted by supporters. But times have changed, and so should the rules. If all the flyers pasted on Dharamsala walls in the lead up to the preliminary election are any indication, candidates no longer need many weeks to ponder over whether to stay in the race. For the 2016 elections, the EC took 47 days to announce the raw results of the preliminary election and additional 61 days to announce the final candidates. Such delays take valuable time away from the final candidates and voters to interact with one another. It also leaves less time for interested stakeholders to organize debates among the candidates, which constitutes a critical feature of the process of educating voters on candidates’ policy stances and future plans. Thus, it is imperative for the EC to declare final candidates within a more reasonable timeline. Additionally, the preliminary voting system was introduced partly to mitigate risks of not having enough candidates running for office. Since the original risk does not exist anymore, we may benefit by revisiting the whole idea of conducting preliminary and final votes. The EC should operate with as much transparency and advance planning as possible so that it does not invite accusations of bias and manipulation. For example, a day after the preliminary election was held, the EC announced it would shortlist only two candidates for the final election with the condition that a third finalist would be added if the vote margin with the second was less than 20 percent. While many saw this as a maneuver to keep Lukar Jam off the ballot, the EC claims it had no knowledge of the preliminary results before making this announcement. To maintain the high degree of legitimacy and credibility it enjoys as an arbiter of electoral process in exile, the EC must announce its final candidate criteria before the preliminary election. 4. Update Campaign Finance Regulations: Unaccounted money in politics can be a treacherous thing for democracy anywhere, but too many restrictions on money in politics can impede freedom of speech. There is no silver bullet solution to this challenge, but within the context of Tibetan democracy in exile, there are two issues that need to be addressed: campaign expenditure ceilings and recognizing only a few Tibetan organizations as exempt from campaign expenditure caps. First, the EC announced a cap of 8 Lakh INR, approximately 13,000 USD, that Sikyong candidates can spend for campaign purposes, and a cap of 3 Lakh INR for parliamentary candidates. Given the fact that eligible Tibetan voters are scattered over 30 countries, it is impossible for Sikyong candidates to run an effective campaign within that budget. Constricting candidates’ ability to meet eligible voters, explain his or her vision for Tibet, and answer questions from the public will inadvertently stymie voters’ ability to thoroughly vet the candidates. So, conducting careful research on how much each candidate spent on his campaign during the 2011 and 2016 elections will help the EC arrive at a more reasonable cap for future elections.Additionally, if the expenditure cap is too restrictive, it raises the risks of candidates ignoring it all together. Then we end up with candidates not staying within the limits and the money they do spend not being transparent. Very restrictive expenditure limits may give unfair advantages to incumbent candidates as well. Second is the recognition of eleven Tibetan organizations as being exempt from campaign expenditure caps. This seems to me to be the Tibetan version of the Super PAC problem in the American politics where Super PACs can spend unlimited amounts of money on their preferred candidate. In a statement issued on October 27, 2015, the EC said it recognized “the eleven organizations on the basis of their having been approved by the Kashag and the Tibetan Parliament before”. Since the Kashag and parliament’s approval is the only criterion to be recognized by the EC, there must be a clearly stated process and guideline that other organizations can follow to seek that approval. If that process remains unclear, the EC has a significant role to play in advocating for clear guidelines from the Kashag and parliament. Some organizations being declared more equal than others by the exile government without a clear set of criteria is unfair to the larger civil society and hampers democratic participation. 5. The EC should Host Its Own Website: As the apex body outlining electoral rules and overseeing its implementation, it is critical for the EC to employ effective information dissemination tools. Additionally, with a large portion of the Tibetan diaspora scattered around the world—it is predicted that 50% of all Tibetans in exile will move to Western countries by 2020—it is imperative for the EC to administer its own website that can hosts all relevant information and news. The current mode of dissemination through the exile government’s website is quite effective, but all election-related announcements, news, and rules and regulations are not organized in one location, making the process of looking up election-related information very challenging. Finally, it will make an incredible and necessary contribution to Tibetan democracy if the outgoing CEC published a comprehensive report on the general elections, including a set of recommendations to pass on as institutional memory to the new Chief Election Commissioner. We often talk about how His Holiness the Dalai Lama gave us the gift of democracy. I believe there is no better way to honor his gift than by exercising our civic duties and embedding democratic values and principles into our daily lives. We owe it to ourselves, to our political struggle, to His Holiness the Dalai Lama, and most importantly, to the millions of Tibetans inside Tibet, to institutionalize an accountable and transparent democratic process in exile. This article was originally published in the Tibetan Review. The writer is a Program Officer at the National Endowment for Democracy, and authoring this piece in her personal capacity.